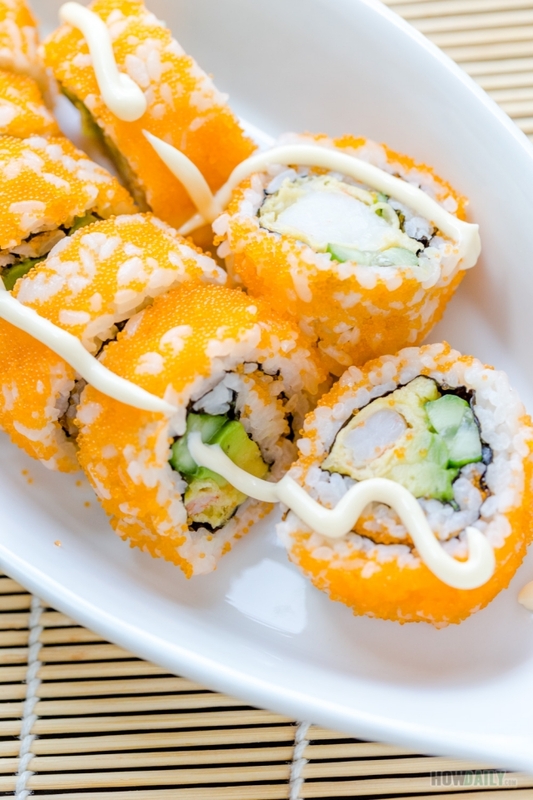 If you love the California sushi roll, then you might like this variant, the Boston sushi roll. This Boston roll is similar to its cousin with only differ in using tempura shrimp or poach shrimp instead of imitation crab. The other accompany vegetable still are cucumber and avocado strips. As a whole, the roll taste crisp due to the addition coat of masago. Now if you’re kind of fear of this raw creature (roe), don’t be. 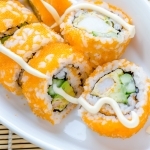 On a sushi roll with deep fry shrimp, you won’t heard the overpower fishy smell. In fact, it tastes mildly sweet and add that punch onto the roll. Avocado served as a creamy solution for this roll, kinda cheesy and hearty melt. So pick the one that half-way ripen. Too much then it’ll be squishy and hard to hold shape well when rolled. I tend to just enjoy this Boston sushi roll with tamari soy sauce, a little bit is enough. Since there’s no raw fish, ginger and wasabi might not need add all. For extra grease, dab on a little bit of kewpie mayo. 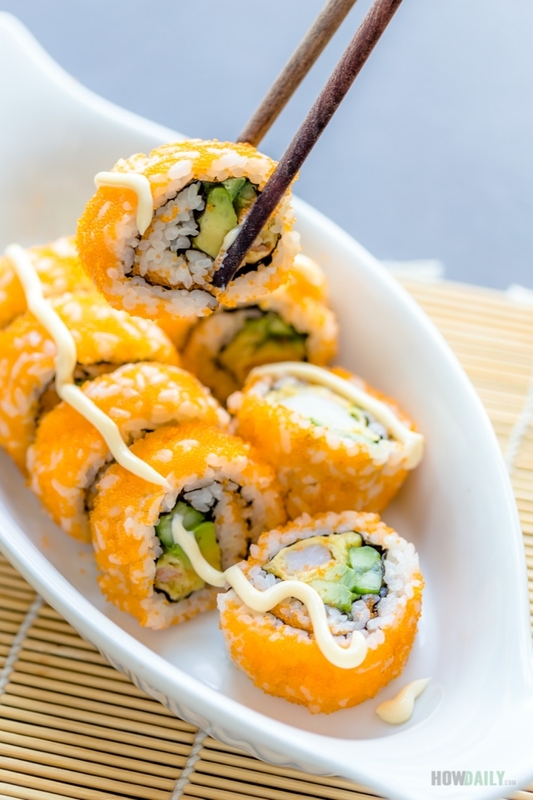 Anyhow, enjoy this roll as a snack or appetizer. Peel off the shrimps' outer shell leaving the last segment with the tail on. Hold the shrimp with both hand and bend it lightly (belly side outward) to make it straight as much as possible. Dust cornstarch all over each shrimp. Heat the oil in deep fryer or wok/deep sauce pan. Gather all the tempura batter ingredients, start by sifting all purpose flour into a bowl. Break open and add the egg then icy cold water into the flour while constantly stirring to mix. Keep your batter cold during the whole process. For this recipe there's no need to, but if cooking larger batch, you may need an icy cold bath for this batter. When the oil is getting hot enough, dip each shrimp into batter, turn and shake it then carefully drop into the hot oil. Cut avocado and cucumber into 4 strips along their length. 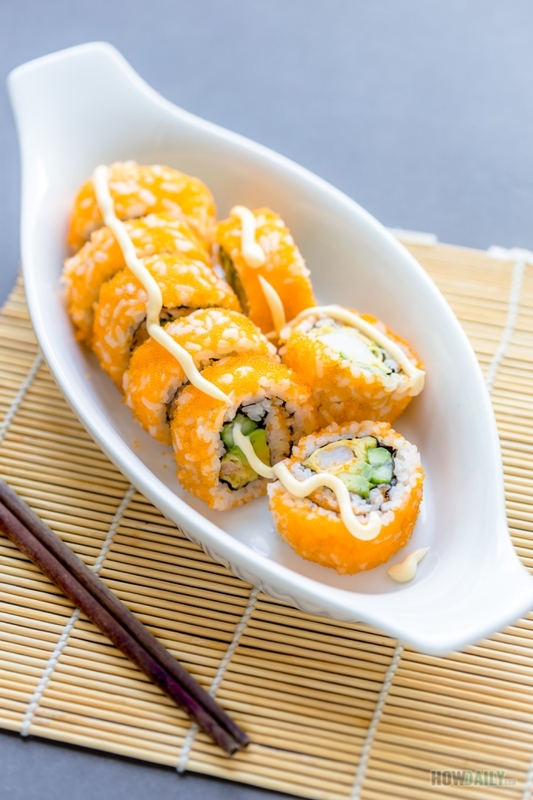 Let's roll in uramaki style for this Boston roll. Folding the nori in half and tear carefully. Place that half nori onto a plastic wrapped bamboo mat, texture side up. Spread 1 cup of seasoned sushi rice onto nori. Spoon 2 Tbsp masago on top of the rice, gentle spread to create an even thin layer. Flip the nori upside down. Arrange tempura shrimp, cucumber and avocado on top of nori. Roll and wrap in plastic wrap, hold a few second to shape and set. Repeat for the other roll. Cut with the plastic wrap on, clean knife in between. Gently unwrap each piece onto serving plate. Enjoy your Boston sushi rolls!